Great, fun, Fair Trade percussion instrument. This carved wooden Frog GÃ¼iro is made from Acacia wood in northern Thailand. 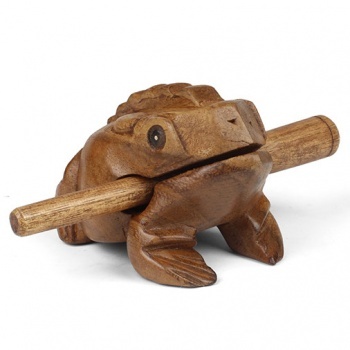 Run the provided stick along the ridges on its back from rear to front to make it croak, or hit it on the head to make a â€˜pockâ€™ sound.